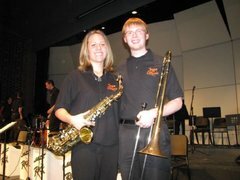 Beth and Mark both play with Misery Bay Big band. Beth primarily plays alto in the band and Mark play bass trombone. 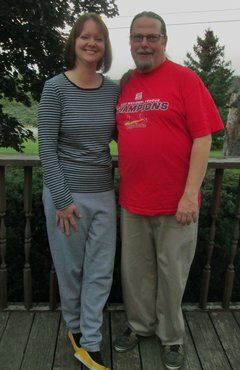 He is also the musical director and lead trombone of the Trinity Music Group out of Pittsburgh PA, and Beth is the lead alto in that group as well. She also is a member of The Presque Isle Saxophone Quartet on alto. The Dresslers both got their undergraduate degrees from Slippery Rock University. Mark graduated with a Music Performance degree and Beth graduated with a Music Education degree. Beth went onto grad school at The University of Miami where she graduated with her Masters in Jazz Pedagogy. They are both currently pursuing musical opportunities as well as working their day jobs. Mark is also an executive board member of the American Federation of Musicians Local No. 17, in Erie. Jim is a practicing musician in the Erie region. He hold a B.A. degree in music performance and composition from Mercyhurst University. He also studied with Basil Ronitti. He currently plays keyboards with the Blues Beaters Band, has a one-man-show in which he plays piano and sings, and has been a songwriter, singer and instrumentalist in Blood Pudding, Magoo, Zebra Mussels and the Lake Erie Monsters bands. Jim also teaches private students. Jim will be performing in JazzErie's Feb. 7 concert "Words & Music," combining blues, jazz and poetry readings. The show will be held at the Erie Art Museum. Jim and his wife Lori serve as co-chairs for JazzErie’s Membership Committee, Jim as a Board member and Lori as a volunteer, currently managing membership renewals and new memberships..
Board members and Committee assignments: Jim Cuneo (Membership), Bethany Dressler & Mark Dressler (Facebook), Ted Ely (Development & Web page, Ed Goebel (Development), Mary Jane Hand (Publicity), Rob Hoff (Performance), Al Lubiejewski (Publicity), Chuck Lute (Education), John Marszalek (Education) Steve Trohoske (Performance).